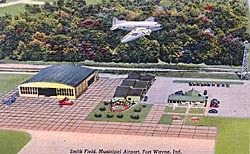 Smith Field, a rare surviving example of an early 20th-century airport, is historically significant for its association with air-related transportation and commerce in Fort Wayne and Allen County, Indiana. In 1919, the city of Fort Wayne inspected the site that eventually became Smith Field for its suitability as a municipal airport. The site was first used for pilot instruction beginning in 1923, and on June 25, 1925, was established as Baer Municipal Airport. Named for a native of Fort Wayne, Paul Baer was the first American Ace of World War I. In February of 1928, a $100,000 bond issue allowed for the formal planning of runways and taxiways, a system that is still in use. Between 1930 and 1937, these were paved and widened by the Civil Works Administration and the Works Progress Administration. The airport became one of the first in the U.S. to have a nighttime lighting system, also funded by the bond, and the 82-foot tall Beacon Tower was constructed. Soon after the addition of several buildings and a commercial airmail carrier in 1930, Smith Field established passenger service. In 1932, the airport served 3,000 passengers, and the introduction of the Douglas DC-3 in 1936 created more flights, thus serving more people. In addition to its historic system of runways, Smith Field is home to several significant buildings. Hangar 2 features three large Truscon Steel Company Doors, a highlight unique to Smith Field in the U.S. at the time they were built. The Carousel Hangar, although outside the period of significance defined for Smith Field, is the only example of Clark W. Smith’s patented design ever built. The hangar is characterized by an innovative rotating carousel door. Smith Field’s tie-down area recalls the era before World War II when hangars were used for maintenance rather than storage, and the aircraft had to be tied down to spiral-shaped stakes in the ground. Smith Field also features ruins of a railroad freight platform, a remnant of the airport’s easy accessibility to a transport for the TDR-1 missiles.